 A savvy look at how the feelings aroused by TV contribute to our political alienation. TV has changed politics, says Hart (The Sound of Leadership, 1987); but attempts to quantify those changes fail to account for how the medium makes us feel about politics. Because faces and emotions are television's forte, the medium overwhelmingly favors personal stories--of the successes and failures of political figures, and of how institutions sometimes miserably fail us. TV thus encourages a collective, even pleasurable, disdain for political life, one that relieves us of any obligation to act. By representing the emotional maelstrom of politics while failing to look beyond it, TV erodes our belief in institutions we must strengthen and maintain. Worse, in emphasizing the epiphenomena of political life, television provides us with a false sense of participation; we even come to believe we're well-informed. 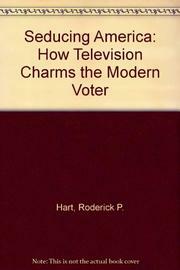 But those who rely on TV for information vote less often and demonstrate less knowledge of issues than those who read. Hart strives to elucidate the ``structures of feeling'' TV produces. He brings recent political and literary theory to bear on his investigation, calling TV ``postmodern'' in its structure and cynicism. Although he does neglect to examine instances where television has led to wider participation in political life (e.g., coverage of the Vietnam War and the civil rights movement), his point is well taken: TV cannot supply us with a political life. Hart calls for a ``New Puritanism'' founded on certain fundamental beliefs: in the unreliability of images; in the dangers of emotional excess; in personal obligation to community; and in hard work toward a vision of some better life. Hart's analysis clearly springs from a belief in our ability to improve our lot. His book will appeal--and offer new ideas--to conservatives and liberals alike.